General. The small village of Annevoie-Rouillon is part of the community of Anhée, which at itself is not very big either. It's located in the valley of the Rouillon, a little stream that flows out into the nearby river Meuse. 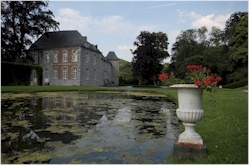 Annevoie is particularly known for its castle and gardens, that are counted amongst one of the most beautiful ones in Belgium. Castle. 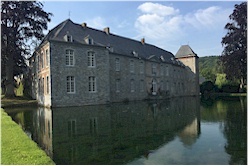 The original castle was built in the first half of the 17th century and ended up in possession of the family de Montellier by the end of that same century. In its current condition, the castle dates back to 1758. 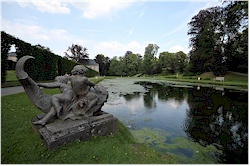 It was built by Charles-Alexis de Montpellier, who also ordered for the laying out of the gardens. Especially the back side of the mansion that reflects into the big pond is characteristic. Note that the facade is not entirely straight but slightly bent. In the outer northern corner of the domain there is also a watermill and in the southern corner, the domain borders the village church. 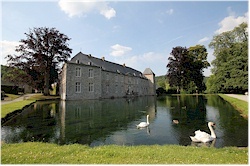 The castle remained in the hands of the de Montpellier family until 2000. Gardens. The gardens were designed on the order of Charles-Alexis de Montpellier. Later generations of the family expanded the gardens and adorned them further with a combination of French, Italian and English styles. Water is a key element in the design: there are various ponds, canals, lakes and fountains. The so-called "Grand Canal" is situated on the highest point of the domain and is fed by a well. This big reservoir regulates the flow of water to the different water features and fountains by simply making clever use of gravity and the principle of communicating vessels. Surplus water from the ponds is evacuated to the Meuse river via the Rouillon streamlet. The colorful flower garden has only been laid out in 1952; before flowers only had a minor role in the concept of these gardens. The gardens are open to the public. The castle itself however, cannot be visited but it is very visible from inside the gardens. The larger part of the gardens is accessible for wheelchair users. There is also a small playground for kids. How to get to Annevoie? The easiest way is to do this with your own transport. It's easily reachable via the Chaussée de Dinant when you come from the direction of Namen or via the Chaussée de Namur when you come from the direction of Dinant. There is a big (paying) parking at the entry of the domain of Annevoie. 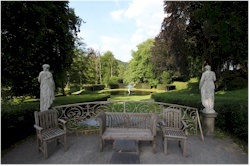 If you come with public transport, then choose "annevoie, jardins d'annevoie" as destination for the bus. The nearest train station is the one of Godinne. You can check our your route via belgianrail.be (bus stations are indicated with "TEC"). Picture 1: the backside of the castle reflected in the pond. Picture 4: the "cascade française"
Picture 5: statue at the "mirroir"